Velebit forms a natural boundary between continental and Mediterranean climatic regions. In its peak areas two different climate zones, the maritime and the continental, collide causing unpredictable weather patterns. 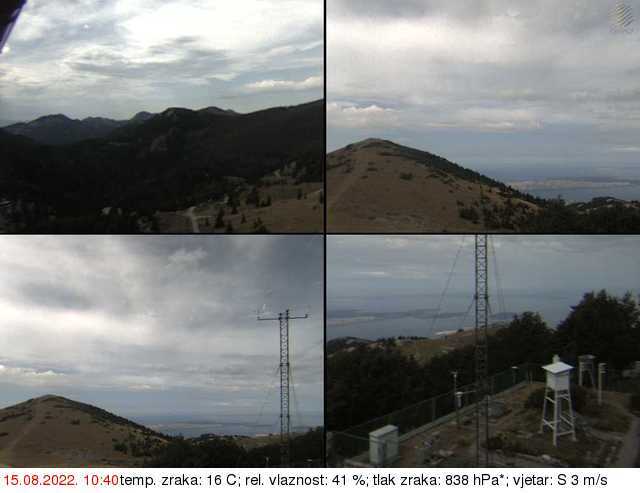 Located within the Northern Velebit National Park, beneath the Vučjak peak, is the highest weather station in Croatia lying at 1594 meters above sea level. Set up on 1 October 1953 this weather station has since been in continuous operation without a single day’s interruption despite the harsh weather conditions in the mountain. The meteorological observers at the Zavižan weather station send meteorological data to the Croatian Meteorological and Hydrological Service in Zagreb on a daily basis, even during strong storm winds, high snow drifts or thunder storms. Over the last 50 years this responsible job has been carried out by the members of the Vukušić family from the village of Gornja Klada at the foothills of Velebit. The observers at Zavižan weather station measure and observe daily the various meteorological elements and phenomena - air temperature, pressure and relative humidity, wind direction and speed, amount and type of precipitation, sunshine, etc. Due to its specific location, the Zavižan weather station has been listed in the International Register of Weather Stations and is included in all international programmes for monitoring trends and changes in physical and chemical composition of atmosphere in the European and the Mediterranean area. The wider area of Zavižan, adjacent to the Gorski Kotar region, receives the largest annual rainfall in Croatia. The most precipitation occurs during the cold season, and the least in summer. Snow may fall during any month of the year. Zavižan has an average of 50 percent of extremely wet days in a season with a relative humidity of 80 percent. Such humidity for the better part of the year contributes to the harshness of the mountain climate, especially during the coldest months. The highest parts of Velebit also have a large number of fog days and fog is associated with a cloudy layer over the summits of Velebit. The largest number of fog days occurs between November and February. During the warm part of the year lightning is a common weather phenomenon in Velebit. Because of frequent lightning strikes one of the highest peaks in north Velebit has been named Gromovača (grom = lightning). In the area around Zavižan the first snow of the season usually falls in mid-October and the last snow of the season occurs in late May. This means that the average snowy winter lasts longer than seven months, during which time meteorological observers are often cut off from the rest of the world. In valleys and sinkholes snow lingers longer, and the so-called snow-holes retain snow throughout the year. The most snowfall occurs in February and March, with an average depth of 130 cm. The deepest snow cover was measured in March 1984, reaching 320 cm. In the snowdrifts formed by wind, the snow cover can be significantly higher, with an unofficially recorded snowdrift in 1984 reaching as high as 15 meters. One of the main climatic features of this area is bora, an easterly wind that often reaches gale force. Bora usually occurs due to penetration of cold air masses from the north. The highest wind speed measured was 38 m/s or 136,8 km/h. Zavižan has an average of 102 days of strong or gale-force winds annually. The Zavižan area is one of the coldest parts of Croatia and the Zavižan weather station has the most snowfall, the largest number of fog days, the strongest winds and the lowest temperature of all weather stations in Croatia. The mean annual temperature is 3.3 °C, the highest temperature ever to be measured here was +28 °C, and the lowest temperature measured was -29 °C. The coldest month is February with an average air temperature of -4,3°C, and the warmest month is July with an average temperature of 12.2°C. All this makes Zavižan a true natural laboratory and an ideal location for learning about meteorology on the spot. This is why an educational trail called The Temper of Zavižan Weather has been set up on Zavižan in 2011. It is accompanied by an informative booklet (in Croatian) of the same name.